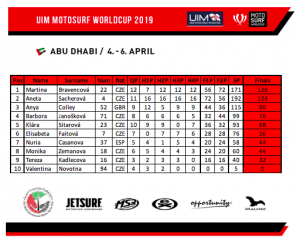 Abu Dhabi in United Arab Emirates was the grand opening destination of the UIM 2019 MotoSurf WorldCup season. 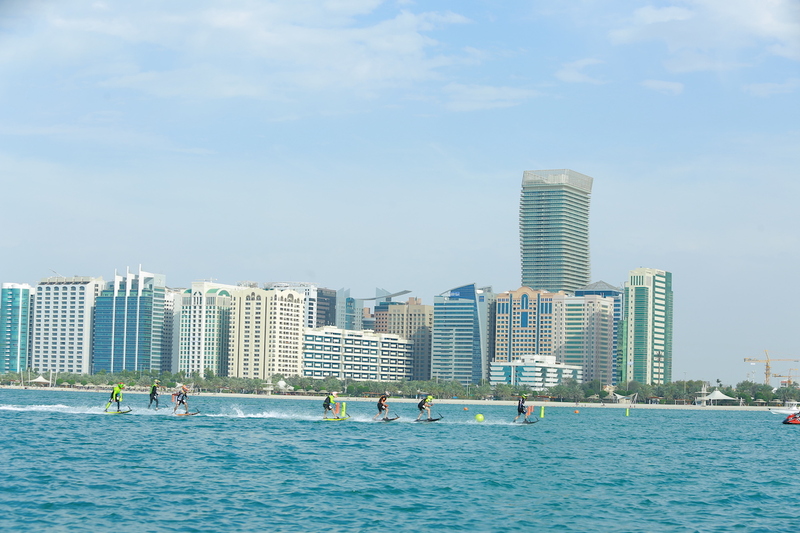 Hosted at the beautiful venue of Break Water Beach at Abu Dhabi Internaitonal Marine Sports Club, the championship experienced its premiere in the Middle East. 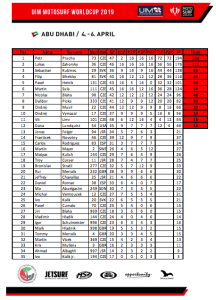 The weekend started with qualifyings where we witnessed Martina Bravencová victorious in the women class. Everybody expected reigning world champion Lukáš Záhorský to post the fastest lap time. Eventually, It was Vít Limr surprising the field with his first ever pole position. The heats started on the second day and eyes all eyes were on Lukáš Záhorský expecting the victory. However, Petr Průcha took the lead and young Slovak rider Filip Sihelský showed his speed. The woans heat were completely dominated by regning World Champion Aneta Šacherová who concluded the Friday’s program on top. 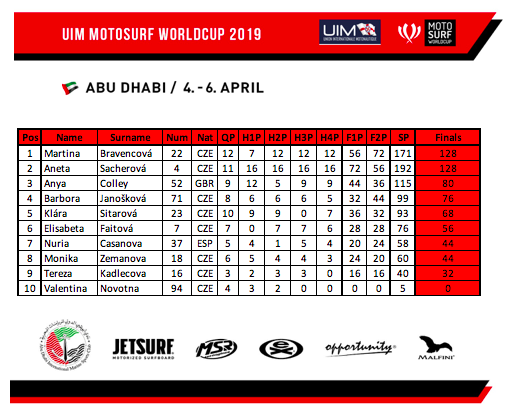 For the first time MotoSurf WorldCup awarded finals first lap winners. Petr Průcha managed to take over control of the whole first Final and won both the challenges. Aneta Šacherová found advantage in the first finals for a victory of the first lap and the final Moto1. Former NHL player Průcha was really close to his first ever MSWC glory and he didn’t hesitate to take this opportunity. Sebastian Kubinec won the first lap but Průcha was simply unbeatable in the AbuDhabi course. He managed to stayed ahead of Lukáš Záhorský and brought his first ever MSWC victory. The women competition was incredibly fierce. We experienced a very close battle between Martina Bravecová and Aneta Šacherová that eventually ended up with Martina victourious.